This essay by Leigh Ann Harris is based on interviews with The Seattle Times, and has been condensed and edited for clarity. I don’t tell people I ran marathons while I was homeless. I don’t tell people I was homeless, because they wouldn’t understand. If you’re in that situation, people usually blame you. Running was the only thing that made me feel normal when I was homeless from 2005 to 2008. It’s the only thing that connected me to the rest of the world. The running is what kept me sane, and stable, and kept me from falling apart. The first time I ran, I had gone for a walk with my daughter at a high school in Seattle. We were walking around the track, and she said, “I dare you to run around the track — the whole track – just once.” I was 48. So I jogged around the whole track. Nearly passed out, but I got around it. I knew that I wanted to do more of it. And then I was jogging a little bit here and a little bit there, maybe half an hour at a time, in the mornings before work. In 2003 or so, I got it into my head ­– “I wonder if I could do a marathon?” I thought about it, and I heard about Team In Training, which raises funds in support of The Leukemia and Lymphoma Society, and went to an information meeting. I paid $75 and committed myself. I didn’t have a car at the time, so my team leader would pick me up and take me to the trainings. We trained for six months, and we got down to Maui where the race was, and I collapsed at Mile 18. They pumped two liters of saline solution into me, and told me I had heat exhaustion. I was very, very embarrassed. I got back from there and I thought, “You know what? 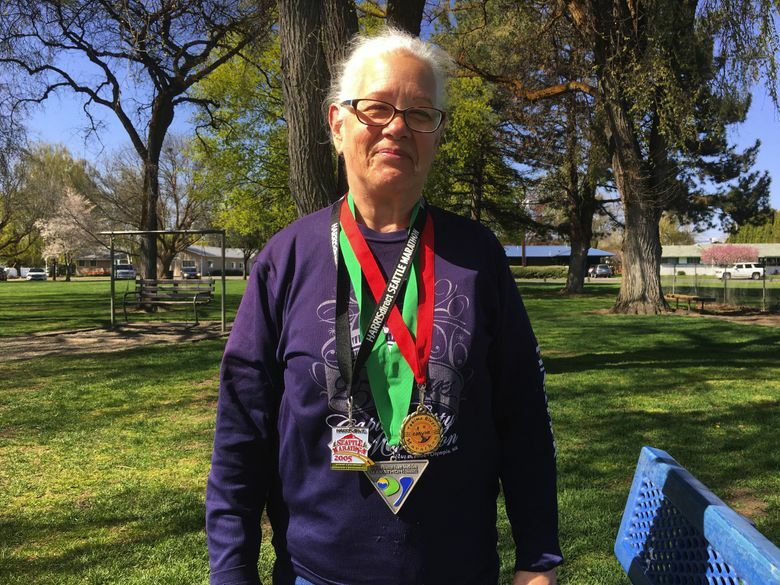 I can’t let that beat me.” I decided to train for the Seafair marathon. At the time, I was not able to find adequate employment, and the economy back then was really wavering. I spent a few years as a house cleaner when the kids were older, but I just couldn’t find enough hours or high enough pay to pay all the bills. I spent one Christmas in a Motel 6. In 2006, I was living in a rooming house whose landlord, it turns out, was not following the code for the city, and all of us were evicted. I ended up in a large shelter for women in downtown Seattle. Everything I owned was in storage, but I couldn’t keep up the payments. When you don’t pay your bill for three months, they auction everything inside of it off. I cried myself to sleep every night for the whole month of December 2006, knowing what was going to happen, and knowing that I had no control over it. That, combined with my experiences in the women’s shelter, led me into a nervous breakdown. I realized I wasn’t going to get through unless I had something to take my mind off my problems. Running was something I did that made me feel like who I really was inside. I ran whenever I could fit it into the day. I would leave at 6 in the morning just as everyone else at the shelter was getting up. I would carry my running clothes in my backpack, and I’d go to where I wanted to run that day. I’d go into a bathroom there and change my clothes, put all the street clothes in my backpack, and try to hide the backpack. My good luck lasted about a year, and then one day on Queen Anne, I came back and my backpack had been stolen with all of my street clothes. I didn’t talk about my running with people other than the Seattle Running Company run by Scott McCoubrey. When you’re with other runners, you’re talking about what’s coming up, or the past one, what the latest difficulty is. It’s an understood language. I never mentioned that I was homeless when I was with the running people — and likewise, I didn’t talk about running with the homeless people — because neither group would understand the other. The very first marathon that I did while homeless was when I was staying at St. Mark’s (shelter for women) — that was May 21, 2006 — the Capital City Marathon in Olympia. I took my sleeping bag with me, and I took the Greyhound down there and slept on the steps of one of the government buildings. The first few marathons were what gave me the confidence to go back to college. It gave me the confidence that I could achieve my goals — if I can do these, maybe I could go to college. I started going to Highline Community College, begging for bus money to get there, attending classes and running, and then begging for money to get back to the shelter. I transferred to Central Washington University and went from a shelter into a dorm on campus. It took me eight years to finish my degree. It was a step-by-step process. “To get there, there’s one thing I need to get done today.” And that’s how I lived. Just like running: I started with just a 15-minute walk every day — running wasn’t something I jumped into right away. Today, I live in low-income housing. Since my last marathon in 2010, I’ve developed hereditary arthritis problems in my hips. I’ve been advised to stop running, although you can’t tell. I’ve switched to triathlons. 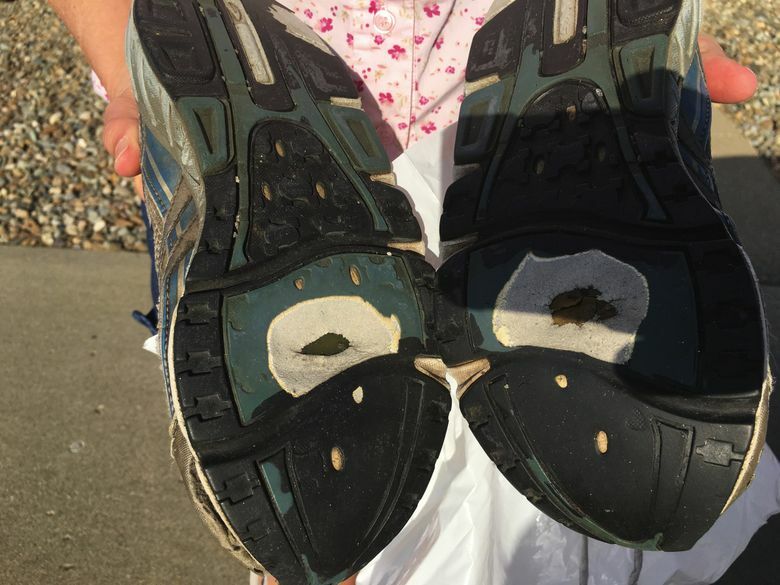 There are shoes I did two or three marathons in, plus lived in them for two years (no wonder my hips are bad). They’ve got holes in the bottoms of them. I hung on to them to remember it all by. They’re one of the few reminders I have of that time. I don’t ever want to forget what it’s like to be stranded and alone without anyone to care about me in the whole world. Because if I get complacent, I’ll be like everybody else in this world who turns a blind eye. A previous version of this article misstated the number of years Leigh Ann Harris took to finish her degree. Do you have a story about your experience with homelessness that you want to tell in The Seattle Times? We’re looking for submissions. Find out more at st.news/yourstory.